Thursday’s mini-adventure: the Supreme Court. Like the Capitol, it’s a building I walk past often but one I hadn’t yet visited. We had a small chunk of time that day, and I wanted to make sure we seized the opportunity. Apparently after August 6, the courtroom will be closed for cleaning—and what’s the point of visiting the Supreme Court and not actually seeing the court? There aren’t official tours at the court, but they do have a 25 minute lecture on the history of the court which is given within the court room itself, so that’s your opportunity to actually see the room, besides getting to poke your head in for a few seconds. The lecture was much more interesting than I expected. I learned a lot about how the court itself works, in terms of proceedings and who sits where. During the lecture we sat in the benches on the public gallery, where average people can sit during hearings if they’re lucky enough to snag a seat. I was amazed at how small the room was. 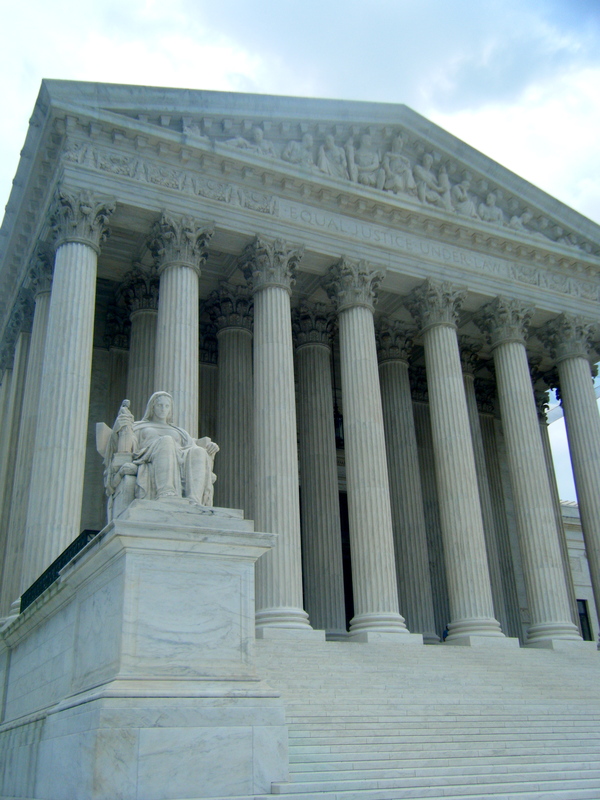 I suppose the name “Supreme Court” just conjures up such images of grandiosity—I expected marble floors and majestic columns, nine seats sitting on an elevated platform… It was a lovely room, to be sure (sorry, no photos allowed) but much more intimate than I would have thought. I would guess the public gallery seats no more than 75. It definitely seemed very reminiscent of the era in which it was built (the 1930s) – a neoclassical style (columns, marble, etc.) with more modern accents, like rich carpeting, deep red drapes and dark wooden furniture. One thing I thought was interesting about our trip is that while we were there, sitting in the courtroom, Elena Kagan was being confirmed by the Senate. When we got home from the court, I checked the news and saw she had been accepted to the position. It just seemed kind of cool that as that was happening, I was sitting in the very room in which she would soon be deciding cases—a very DC moment. Army Band on the steps of the Capitol. 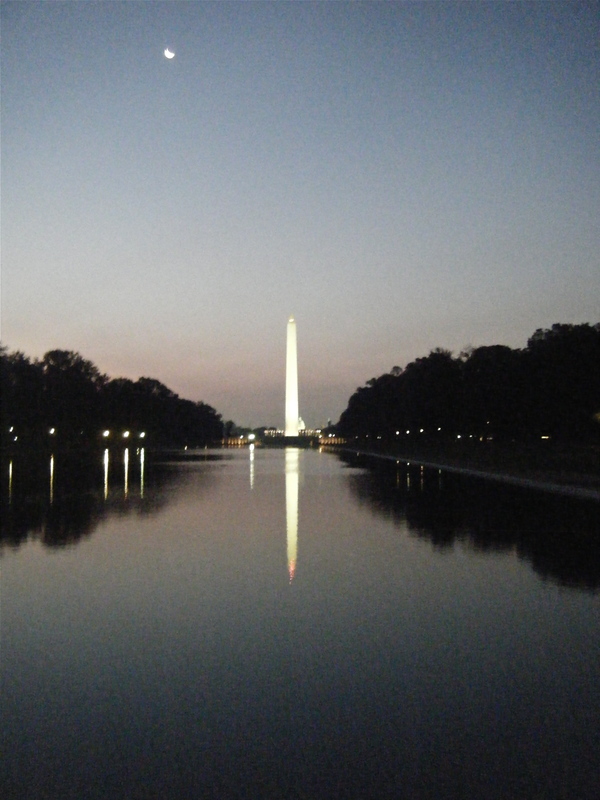 Another very DC moment: on Friday evening, I went for a walk with a couple other students, just wanting to get some fresh air. 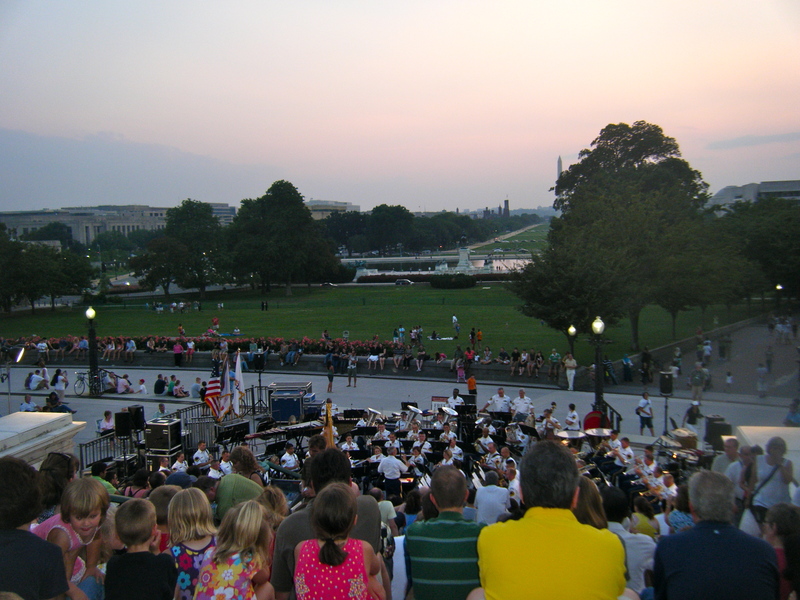 As we were walking around the Capitol, however, we heard the beginning of the national anthem and found the Army Band orchestra at the steps of the Capitol, getting ready to begin a concert. We quickly abandoned our walk and settled in with the dozens of other people (how do they find out about these things??) to listen to the show. The night’s theme was movie scores, so there were plenty of recognizable tunes, including Disney and Sound of Music medleys. I call it a DC moment become that seems to be very typical of this city in the summer – a lot of random events and concerts to stumble upon, taking advantage of the pleasant evening temperatures. This morning was an adventure of a different kind. 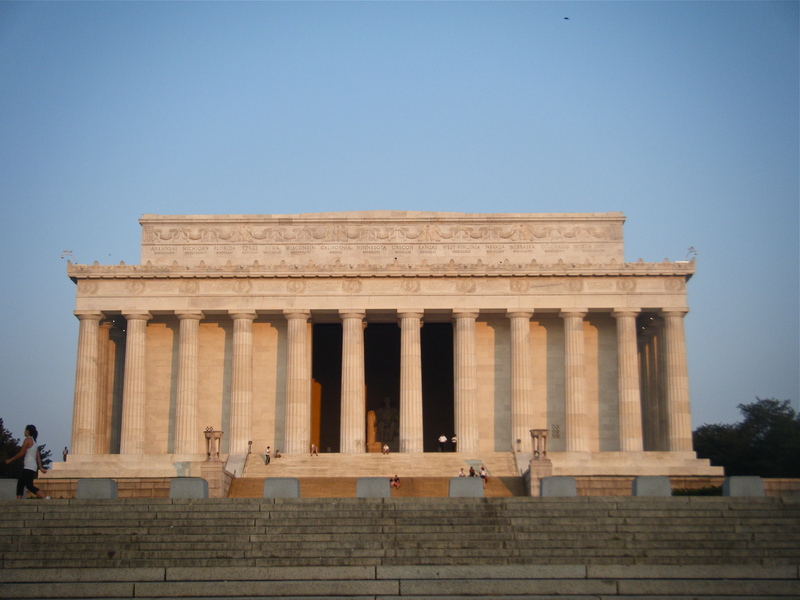 A group of us had decided that we would like to go see a sunrise from the Lincoln Memorial so we settled upon this morning to go. One complication of that is the Metro does not start running until 7 a.m., so we would have to walk the whole way (3 miles). But, we were feeling intrepid, and so off we went at 4:30 in the morning. It was really interesting to see such a familiar location (the Mall) at such an odd time. Everything was deserted and quiet, but in a peaceful way, not an eerie one. 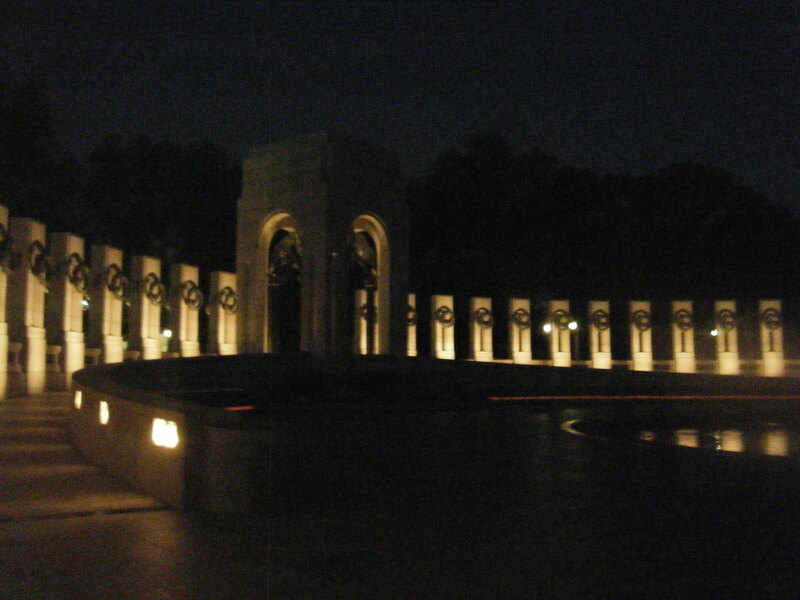 The World War II memorial was especially lovely at that hour, I thought – it was softly lit, and the only sound was the murmur of the various water features. We made it to the Lincoln Memorial around 5:30 a.m. (right on schedule!). It was so neat to be there with so few other people. Granted, seeing the sunrise from there is not an entirely novel idea; there were probably 20 or so people there with us. But compared to the hundreds that are crawling over it during the day, it’s kind of special to be able to stand in front of the statue of Lincoln and not have to be disrupted by throngs of tourists. 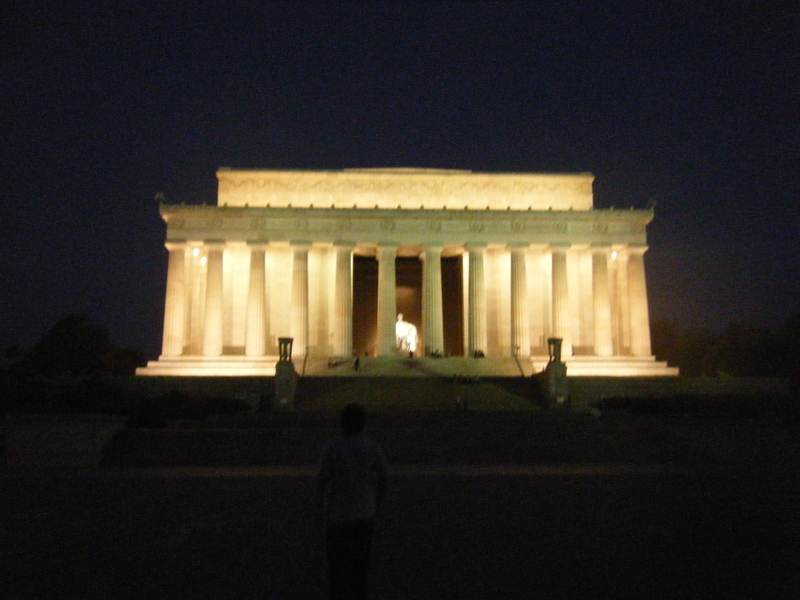 Lincoln Memorial at an ungodly hour. 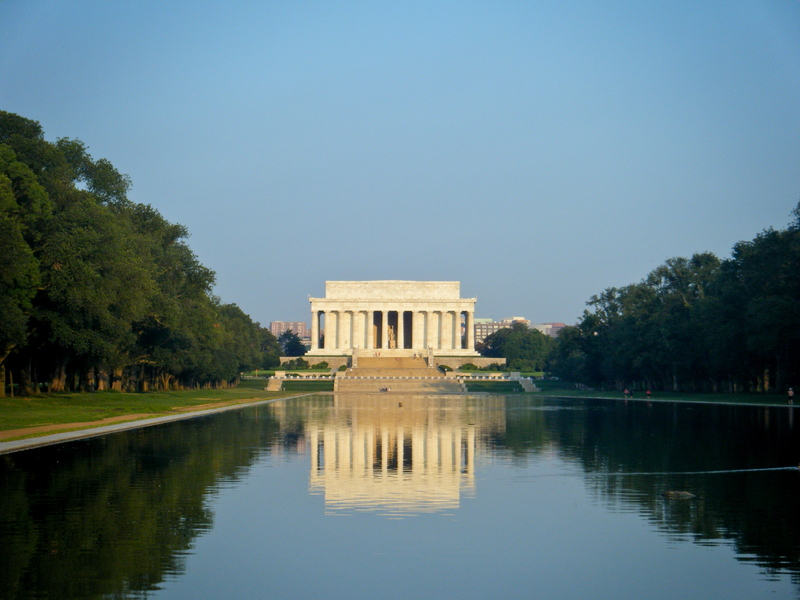 That’s the real value in seeing DC at sunrise, I think – you get a chance to enjoy all the popular monuments in a very personal way. The sunrise itself wasn’t anything spectacular, in my opinion. But sitting there in the quiet of dawn on the steps of one of the city’s most popular and recognizable spots was a special experience, and I’m glad I did it. 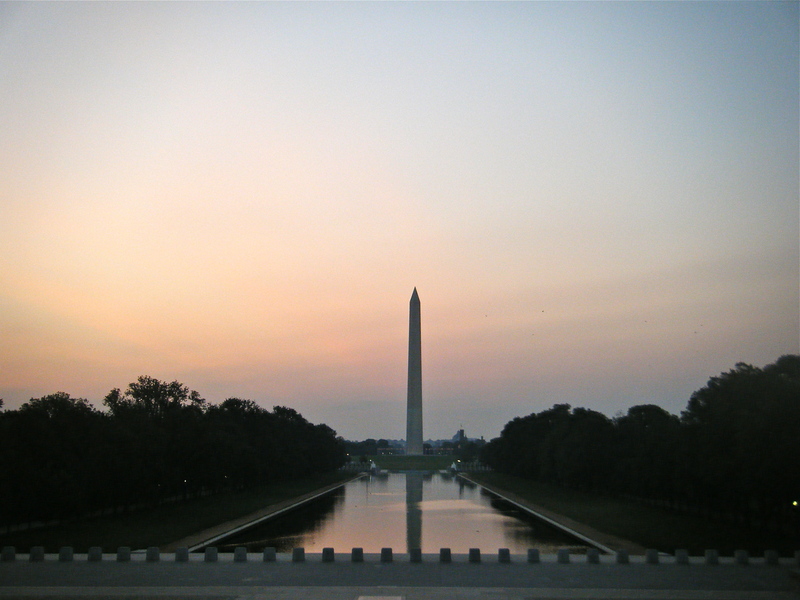 Another upside of the sunrise trip is that we were able to get in line for tickets to go up the Washington Monument. They release same-day tickets on a first-come, first-served basis at 8:30 a.m., so people usually line up in advance. We got there around 7:15 and there were already maybe 30 people in front of us. But the line quickly ballooned behind us to probably 100 people, so I’m definitely glad we got in line when we did. I’m not sure what to expect from the tour, but hopefully it’ll be fun and the view will be nice—we specifically timed it to happen around sunset. And thus our day will come full circle. The memorial as the sunlight hits it. If you've been here, you can appreciate that the lack of people in this shot is pretty impressive. 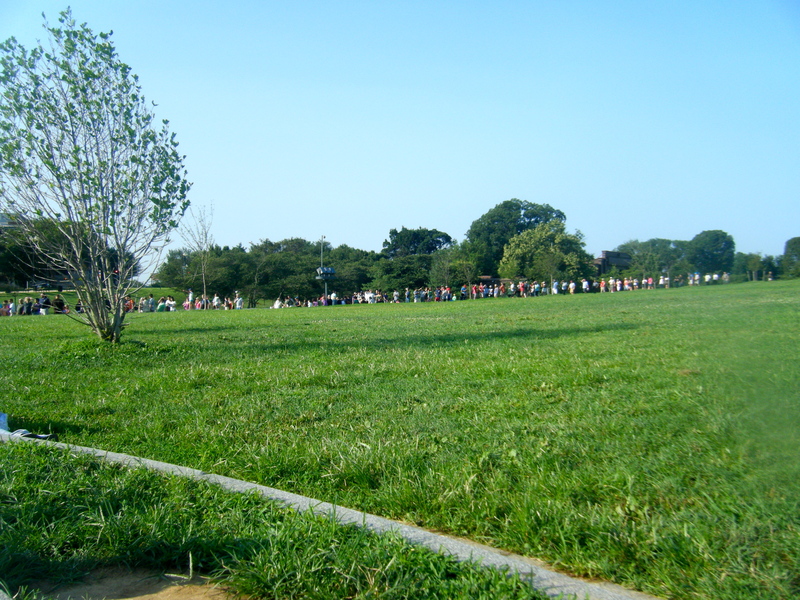 The line for Washington Monument tickets. Someone should have gotten up a little earlier! Great sunrise story – good for you! Also….these are really fun pics. Good job! Can’t wait to see you again. Love you tons.